M. E., the latest kitchen faucet from GRAFF, is designed to simplify every day work and to respond to the increasing desire to personalise the home environment. Cylindrical lines and simple shapes blend together to create an elegant mix which offers character to a modern or transitional kitchen setting. Additionally, the M. E. mixer makes food preparation and cleaning easy—the kitchen becomes a pleasant space to spend time with friends and experience creative cuisine. Equipped with a pull-out spray and ergonomic grip, the faucet is ideal for daily activities such as washing fruits, vegetables and dishes, as well as filling bowls or pots with water. To meet every need, while maintaining the user’s comfort, M. E.’s single lever faucet is also equipped with a rotating jet and two types of functions: spray and stream flow. The M.E. 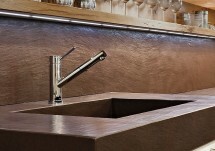 is available with a finishing option between polished chrome or brushed nickel. The different models available are: deck mounted version with a traditional or side handle, and various spout heights, to make operations easier in the presence of large pans and containers.